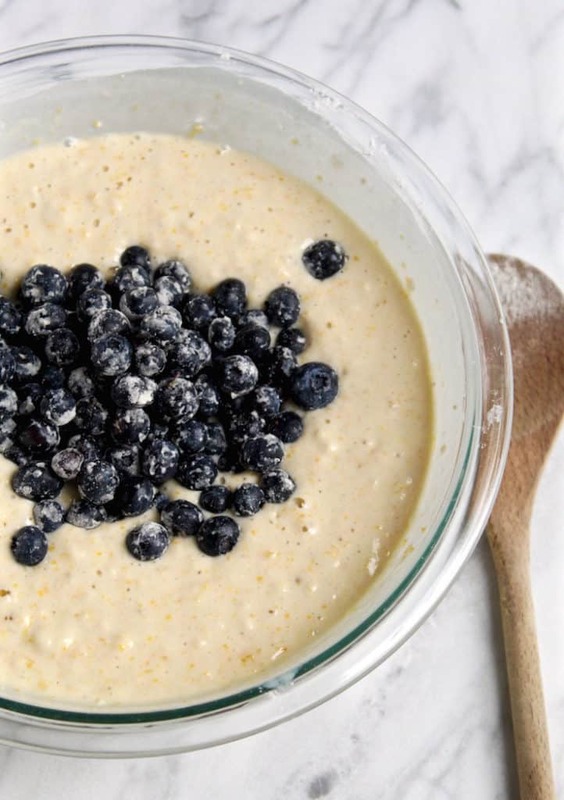 Weekend worthy pancakes with cornmeal-buttermilk batter and blueberries. I don’t make pancakes often, mainly because they’re not Meathead’s favorite and because I think they’re a lot of work first thing in the morning. Maybe that’s why pancakes are for weekends. Still, I’m not one to rush into the kitchen when I wake up and start cooking or baking. 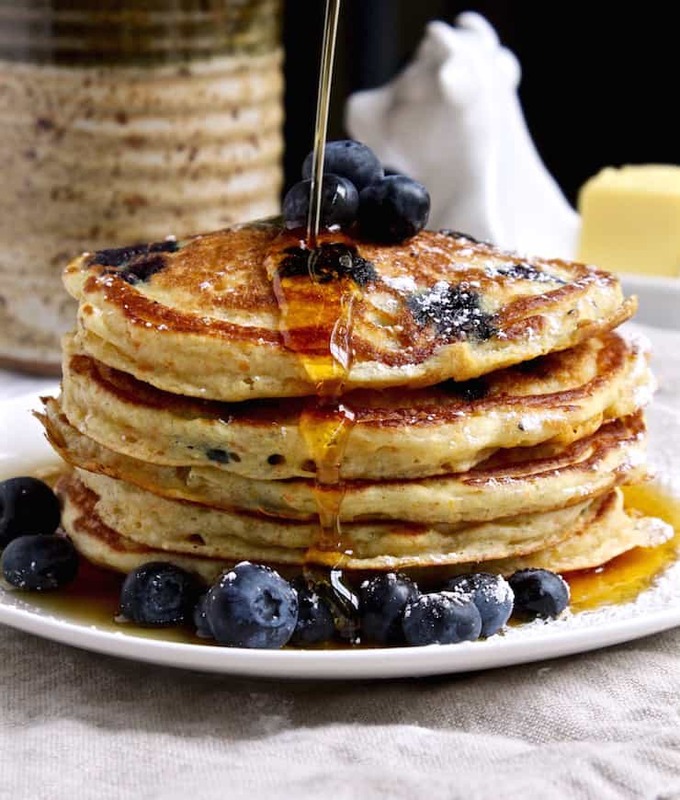 But I’ll make an exception for these cornmeal blueberry pancakes ~ they are worth it. Years ago, when the kids were little and we lived in Minnesota, we went to a lodge near Hayward, Wisconsin in the Chequamegon Forest. It was a step back in time with quaint cottages lining Teal Lake. Meals were included and served in the lodge dining room. My favorite for breakfast were the pancakes ~ I loved the taste and especially, the texture. The owner told me they used sour cream and cornmeal in the pancakes, just like her mother-in-law did. I loved those pancakes and our trips to Teal Lake. I decided to try making pancakes and came across a recipe in the New York Times that used cornmeal. I gave them a try and they were really good. Blueberries are still abundant in the markets this summer and so are local peaches. Try layering some ripe peaches between the pancakes for a stack of deliciousness. I want to try adding some sour cream but I’m not sure how, any ideas? Maybe next time I’ll replace some of the buttermilk with sour cream and see what happens. Who knows, maybe they’ll taste just like the ones at Ross’ Teal Lake lodge ~ a girl can dream, right? 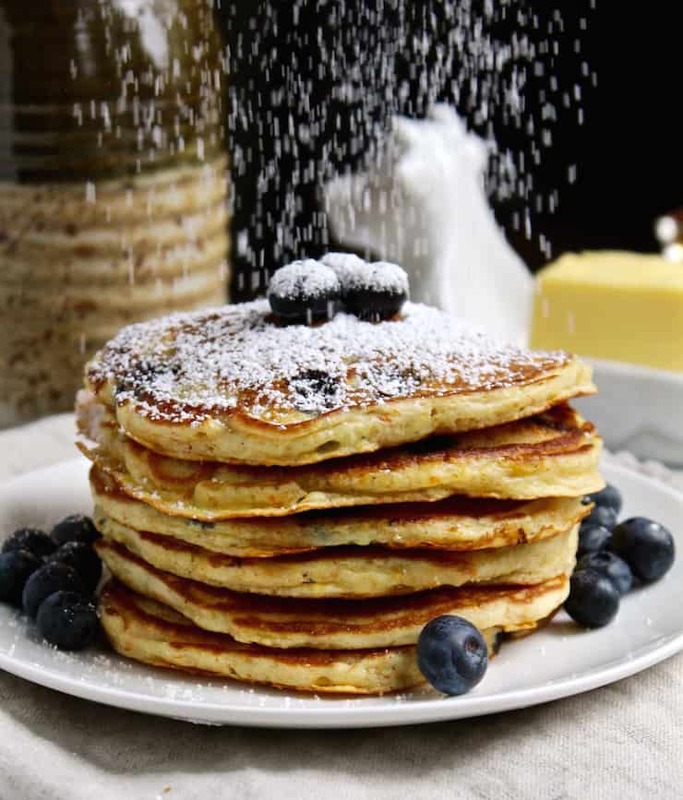 If you try these pancakes or any other recipe on the blog, then don’t forget to rate the recipe and let me know how yours turned out in the comments below ~ I love hearing from you! You can also FOLLOW ME on FACEBOOK, TWITTER, INSTAGRAM and PINTEREST to see more of what I’m cooking in my kitchen and recipes. 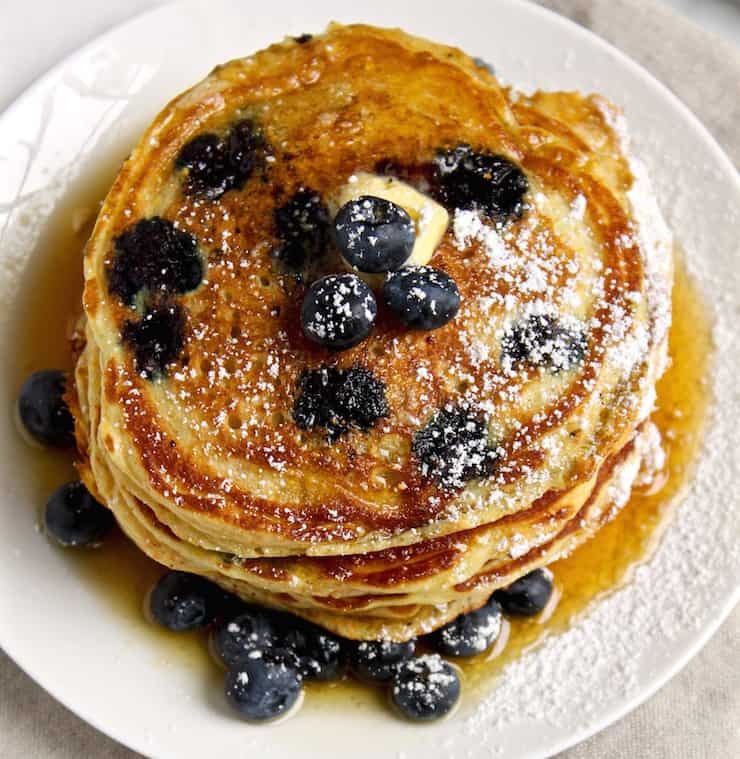 Weekend worthy pancakes with cornmeal batter and blueberries. Heat oven to 300º to keep pancakes warm. Whisk first 6 dry ingredients together in a bowl. 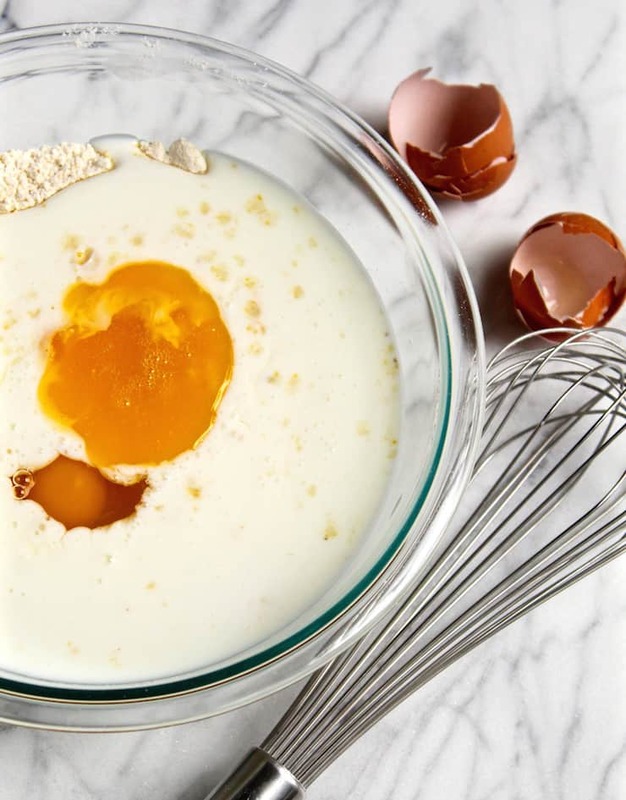 Make a well in center, pour the buttermilk into the well and then crack the two eggs into the buttermilk. Pour the melted butter into mixture. Start in the center and whisk toward the outside of the bowl until all is incorporated. Do not overmix, lumps are totally expected and just fine. 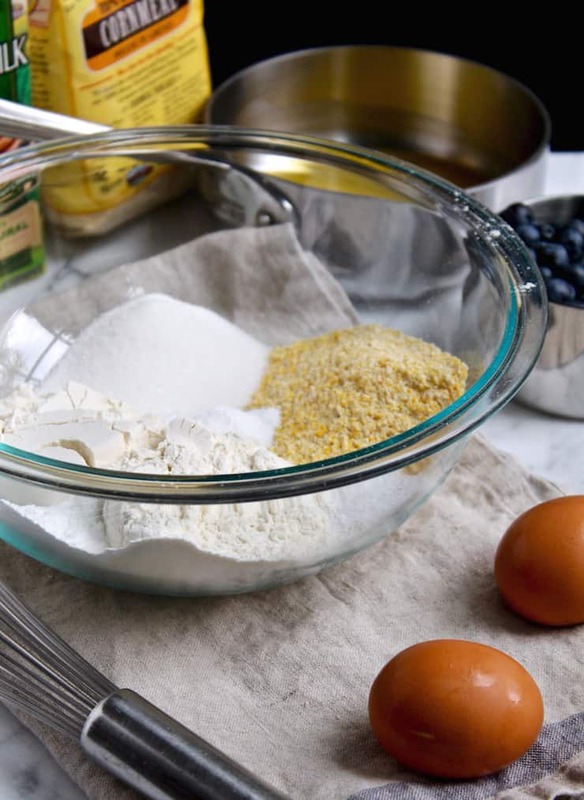 Coat blueberries in 1 teaspoon of flour and add to cornmeal batter. Carefully flip pancakes when full of bubbles and bottoms are nicely browned, about 3 to 4 minutes. Cook another 2 to 3 minutes on other side until lightly browned. Remove pancakes to wire rack inside a baking sheet and keep in oven until all pancakes are done and ready to serve. Add more oil as necessary. Dust with powdered sugar if you like, and serve with butter and pure maple syrup. Enjoy. Did you make this recipe? Rate it below and share on Instagram so I can see!Mention @thehungrybluebird or tag #thehungrybluebird ! I am so making these! We used to vacation up at my aunt’s cabin in Spooner, which isn’t too far from Hayward! Such a pretty area, lots of memories. 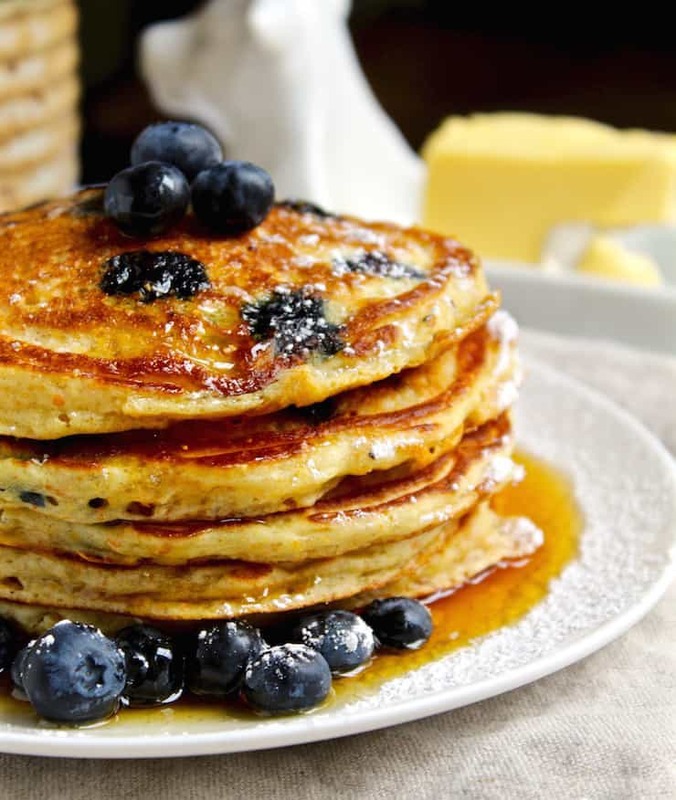 the most beautiful blueberry pancakes in the world!